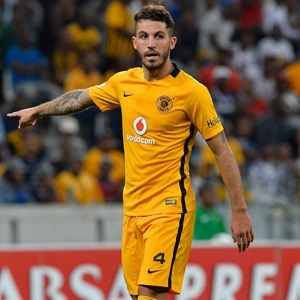 Cape Town - Kaizer Chiefs defender Daniel Cardoso feels he is close to his best form and is optimistic of helping the team win Saturday's Telkom Knockout semi-final against Bidvest Wits. The 28-year-old centre-back has battled with injury since joining Amakhosi in the 2015/16 season, but started regularly of late and helped the Glamour Boys keep four clean sheets in their last four outings. "It's a good formation," Cardoso told the club's official website, in reference to the three-man central defence Chiefs head coach Steve Komphela has been employing. "It works well for us, as we have kept a clean sheet for our last four matches. It's great to be playing on a regular basis, after having struggled a bit with injuries and suspensions. The coach trusts me and that helps. "I am nearing the form that I reached, while playing for Free State Stars. With playing comes confidence." Discussing the possibility of reaching the 2017 Telkom Knockout final, provided Amakhosi can defeat the Clever Boys at the Bidvest Stadium on Saturday afternoon, Cardoso revealed the mood in the camp. "We have been talking a lot amongst ourselves about it. It provides us with an opening to win a trophy and that's something we need - for the club, for the players and for our supporters," he said. "The Wits match won't be easy. However, we are one game away from the final and we need to grab that opportunity with both hands."